Today marks the second week of NJASK testing here in New Jersey. Grades 5 and 6 began testing this morning, and make-ups are being conducted for 7th and 8th graders that weren't tested last week. Last week parents were told that if they insisted on opting out their child's test would be scored a zero and their child would be placed in remedial classes next year. Reports are coming in today that students are being forced to sit through make-up sessions even though they opted out last week. The only options presented to parents are to keep children home during the make-ups or have their child pulled from class only to sit in front of a blank test booklet. NJ opt-outers are attempting to work with administrators to come up with more student-centered solutions for their children. Diane Hewlett-Lowrie is one of the brave moms starting an opt-out journey this week. Here is a guest post she wrote clearly demonstrating that New Jersey parents know EXACTLY why they are opting out! Nobody I know in the real work world has to produce a 5-paragraph persuasive essay in 30 minutes – without being able to research and verify facts via good sources. Please note, our child consistently gets As and Bs on report cards. Our arguments with the standardized tests are not related to our child’s academic ability, but are everything to do with the numerous reasons listed here. Teachers in England boycotted the national tests for 11-year-olds because it took away from valuable teaching time and put an undue burden of stress on young children. The United State’s education system and its current direction is becoming the laughing stock of the world. WE ARE GOING IN THE WRONG DIRECTION, AMERICA!!!! How Do Education Foundations in New Jersey's Top Towns Stack Up To Billionaire Philanthropy? Not So Well. A comment I received on my post Hebrew Charters Hit The Broadway Stage kind of irked me. Don't get me wrong, I LOVE a good debate, and have no problem being challenged. In fact, I welcome it. I just wish anonymous commenters that take the time to do some research and go toe to toe with me would let me know who I have the pleasure of debating. Anonymous brought up an interesting point, that when I compared the Hebrew Charter School Center's (HCSC) Broadway fundraiser to my school's PTO collecting boxtops, I was leaving out the fact that often Education Foundations raise far more money for districts than PTOs or PTAs. So it made sense to look at how Education Foundation giving stacks up to the likes of the HCSC. As I was doing some research for my response to Anonymous' comment I realized there were lots of links I wanted to add, so here is the comment and my response as a post instead. It seems to me that that the Hebrew Language people may have learned from Highland Park what a good fundraiser theater can be: This past year the Highland Park Education Foundation hosted an evnet using its Broadway connections to raise money when they featured Amy Herzog at the Italian Bistro. The Highland Park Education Foundation has boasted over the years raising thousands of dollars for the Highland Park Public schools, and I would think that the Highland Park Education Foundation folks would love to leverage other famous HPHS grads like Sam Hoffman, Willie Garson and Soterios Johnson. So while the Matilda fundraiser may have been a bit more sucessful, Highland Park is hardly limited to boxtops. The Princeton Education Foundation has boasted giving their district $113,000 this past school year. The Rumson Education Foundation boasts having raised $15 Million since its inception for their school district. The Somerset Hills Education Foundation just raised over $100,000 at their chiili cook off. The Summit(NJ) Education Foundation just raised $150,000 at their Casino night fundraiser. And the foundation boasts giving their public school districts $342,000.00 in grants in 2012. Ah, I love it when Anonymous posters make a point to call me out by name. Anonymous, I can't speak for Rumson, Princeton, Summit or Somerset Hills. Those districts have nothing to do with my district, or Hatikvah. But I do appreciate your point that often Education Foundation fundraisers pull in more money than PTO, PTA or parent driven fund raisers, and I ignored that. So lets compare the Highland Park Education Foundation (HPEF) and the Amy Herzog fundraiser you mention with the HCSC and the Afternoon at the Theater fundraiser I wrote about and see if you have a valid point when you claim that "other public school supporters have been very effective in raising very large sums." Amy Herzog is an HP alum, and is now a successful, albeit still off-Broadway, playwright. She came back to her home town and gave a talk at a local restaurant. I forget the ticket price for the event, but I can assure you it was far less than the $50,000 some of New York's wealthiest families paid to see a private showing of a Tony Award nominated Broadway production of the Royal Shakespeare Company. According to their website, in the last two years the HPEF has awarded a little more than $25,000 in grants. That's two years worth of work to raise HALF of the $50,000 some folks shelled out for just 12 of the 1460 seats at the Shubert Theater. According to HCSC's 990, in 2010 alone Hatikvah received $248,596, and that DOES NOT include the $142,000 that was given to their after school programs. So Anonymous, your attempt to equate a home town girl done good helping to raise a little bit of money at a local bistro and the HCSCs ability to commandeer an entire performance of a hit Broadway musical kind of falls flat. I'm kind of intrigued now, so let's explore this idea a little further. Above I said I wouldn't address the other Education Foundations you mentioned, but doing so may in fact be interesting. The towns you list are some of the wealthiest in the state, so I wonder how they stack up against the giving power of the HCSC? That sounds like a lot of money, right? Except according to that same 990, HCSC gave out 1.2 M in 2010 alone and had 4M in total assets. And let's take this comparison just one step further. Rumson has about 1,000 students and Hatikvah has around 200. If Rumson schools get about $90,000 per year from their Education Foundation, that breaks down to approximately $90 a student. We've already established that Hatikvah got almost $400,000 in 2010 for their charter and after school programs. Anonymous, while you may have a point that Education Foundations raise more money than the bake sales, book fairs and box tops I wrote about in my original post, they're not exactly raking in the "very large sums" you indicated. Even Education Foundations in New Jersey's wealthiest towns fall FAR short of the giving power of billionaire backed foundations like HCSC. Traditional public schools can not match the private money that flows into charter schools backed by hedge fund billionaires. Are Children Being Used As Pawns In The Game Of High Stakes Testing? Today marks the end of NJASK testing for 7th and 8th graders in New Jersey, with 5th and 6th graders in the hot seat next week. NJ parents across the state are opting their children out, and we are working together to find ways to make the experience as smooth as possible for our children. 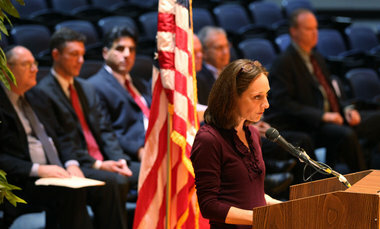 NJ mom Lisa Grieco-Rodgers has chosen to have her 6th grade child opt out, but her 4th grade child will take the test. She explains that her daughter is a strong student and has taken the NJASK in 3rd, 4th and 5th grade. This year her daughter has already sat through end of the marking period tests, district placement tests and now weeks of test prep. Grieco-Rodgers asks, "when is enough, enough?" We can all appreciate the need for standards and guidelines and the people that must enforce them. However, when the pendulum swings too far and these standards and guidelines become counterproductive, adversely affecting our children, then the constituents who voted in our representatives need to speak up. We chose to keep our 6th grade daughter home during NJASK testing this week, because enough is enough. Our daughter has taken the NJASK for 3 years now, and based on the NJ DoE changes that are coming in 2014, she along with her brother will be tested until 11th grade. Our daughter is a straight A student, in AP Math and in general actually finds testing to be a fun challenge – go figure. However, when NJ ASK prep started 2 weeks before the actual test, she came home saying. “Mom, I just finished all the trimester tests and the district placement test. Do I really need to go through 10 more hours of testing?” Her father and I said “NO!” Enough is enough. As her parents we are actively involved in her and her brother’s education. Each night we review their homework and weekly, we discuss their work to determine if they need more support. In her particular case, this year, NJASK proves no value to her. In fact her placement into 7th grade will be decided on before the NJASK results are published in September 2013. As for our son, we chose to allow him to take the NJASK in 4th grade for after discussing his abilities with his teacher and the principal we decided that since he has not gone through the battery of testing our daughter has the NJASK will help reinforce what he has learned and strengthen his test taking abilities. Many folks have said to me, aren’t you contradicting yourself? No, it’s OUR CHOICE based on the needs of the individual child. We are their parent’s, we decide what is best for our kids. NJ DoE however, does not believe we have the right to decide and in the end could potentially penalize the school districts and our kids for OUR CHOICE! We understand that the school district must follow State regulations – for they have NO CHOICE. But it is time for each district to take a stand and speak out that the district should NOT be adversely affected financially or otherwise, because of a parental right. The State is holding the district hostage. Less than 95% participation could potentially impact district funding from the state. The children also have to miss 10 hours of class during test make up week, because the State DoE has stated that they cannot attend class if they don’t take the make-up test. How ridiculous is this! We have already decided that they NOT take the test! Since when do we live in a communist state? Please tell me we have not fallen into a dictatorship! Why should the state penalize the school district because of OUR CHOICE? There is nothing wrong with assessment testing, when administered appropriately, but when is enough, enough? Whether or not you believe the pendulum has swung too far already, wait…. NJASK currently tests kids for 10 hours per year from 3rd-8th grade. When PARCC testing is implemented, it will bring this to a whole new level with FOUR new rounds of tests totaling 12 hours per year from K-11th grade. We hear over and over from state regulators that parents are using their children as pawns. Really? When the State withholds money from the district if the district does not achieve 95% participation rate on the NJASK and when the State does not allow our children to attend class during test make up week – then who is REALLY holding our children as pawns?